1. Get students excited about science! Many kids throughout their primary education do not enjoy science or do not have the opportunity to experience creative, hands-on, and relevant applications of the field. Our goal is to introduce entertaining demonstrations in an educational way to help students understand that chemistry really is fun. By instilling these ideals at an early age, we can encourage young students to continue exploring and experimenting. 2. Get girls interested in science! Women continue to be under-represented in STEM careers. 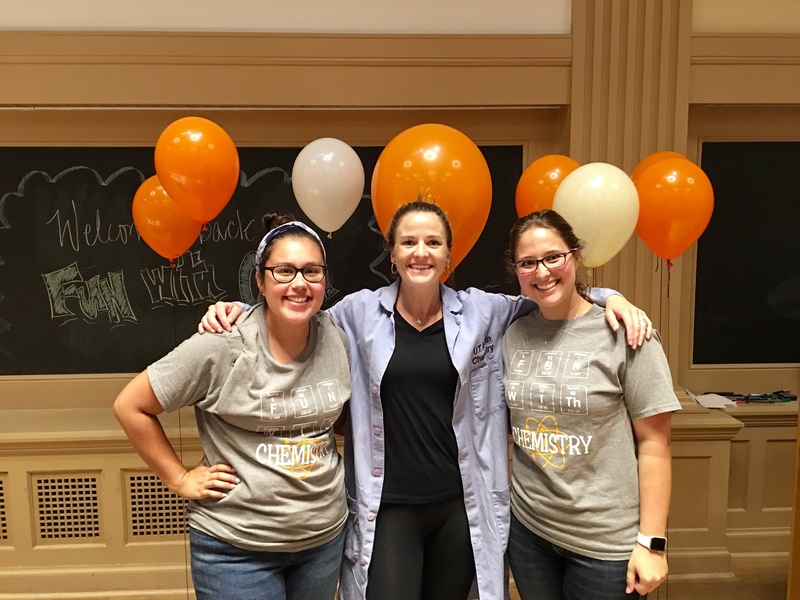 Our Fun with Chemistry shows are led by three female, chemistry graduate students who hope to act as strong role models to inspire young girls to continue growing their passion for science. 3. Find creative ways to present science! We believe that the way information is presented can have a strong impact on the outcome of the lesson. Students who are only exposed to PowerPoint lectures and textbook readings can easily become disinterested with a subject that is so heavily focused around hands-on applications. Instead, our presentations focus on audience participation and discussion. By starting with a brief and interesting introduction of a topic, we are able to convey important information before diving into the fun demonstration. After application of the concepts, we ask critical thinking questions tailored to the level of our audience and ask students to participate by discussing with their peers. This fosters intellectual discussion of the lesson and allows students to begin thinking critically and creatively about science. 4. Expand community involvement! While our demonstration shows are tailored toward helping the community, our graduate students volunteers also develop important teaching and leadership skills. While much of graduate school is focused around research, this program allows us to take a fun break while continuing to expand important skills necessary for a career in science. We have a large group of graduate students from diverse chemistry backgrounds who help make this program possible.